"41MR12, Line of Artifacts, 60" by Timothy K. Perttula and Robert Z. Selden Jr.
DECORATION: The short rim has a cross-hatched engraved panel that encircles the vessel. The top and bottom of the panel are defined by single horizontal engraved lines that encircle the vessel rim. 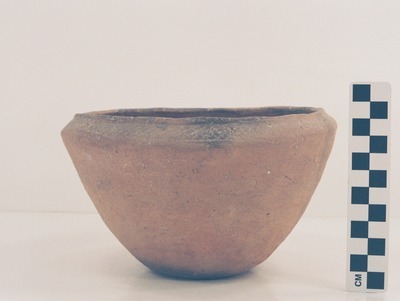 Simms Engraved carinated bowl from “line of artifacts” at the Ben McKinney site.